Our club was founded in 1950. We have been in this building ever since that time. Our members are also members of the Marion Union Station Association, which is in charge of preserving the building and grounds of this historic Erie Railroad station. It is one of the most popular railfan spots in Ohio because of the train frequency. We are open each Sunday of the year from 2 P.M. until 5 P.M., with one or two exceptions per year. Our work sessions are on Thursday evenings. Our meetings are generally the last Sunday of the month. Follow the links below to learn about our history, where we are located and get here. This is the main entrance to our club. 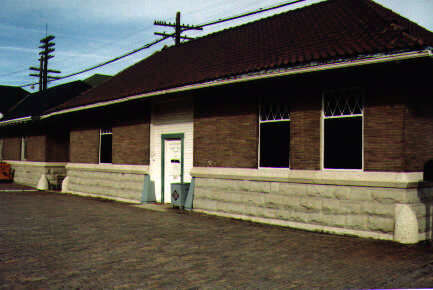 It is an old baggage building in the Marion Union Station Complex. If you require additional information about the club, or have comments about this site, please feel free to email us at marionrrc@yahoo.com.